A new survey has found that 42% of current American drivers could use EVs with little change to driving habits or costly home charging infrastructure. Range anxiety, and the associated fear that modern American driving demands rule out an electric vehicle for consumers, often creates a gap between positive consumer perceptions and actual EV purchases – but what if drivers have it all wrong about EVs? According to a new survey from the Union of Concerned Scientists (UCS) and Consumers Union, 42% of current American drivers can use EVs with little change to driving habits or costly home charging infrastructure. 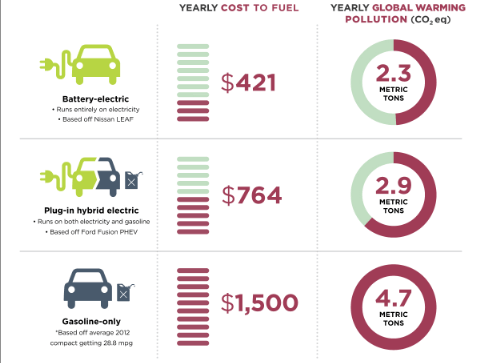 In addition to demonstrating that today’s EV technology can work for millions of American drivers, the UCS study also hints at the staggering environmental and economic benefits EVs hold for the United States. The telephone survey, conducted among American drivers who currently own vehicles, revealed that while less than 1% of the country currently drives an EV, 45 million households meet the basic criteria for using plug-in hybrid EVs (PHEV) like the Chevy Volt. Furthermore, 25% of US households would be able to use a battery-only EV (BEV) like the Nissan Leaf. In order to fall into the EV-eligible category, drivers had to meet several basic requirements. PHEV-eligible drivers had to have access to parking and any outlet, five or fewer vehicle occupants, and no hauling or towing needs. BEV-eligible drivers also needed an outlet specifically located at their home, drive a maximum of 60 miles on weekdays, and own more than one vehicle or infrequently take long trips. These requirements may seem onerous, but they’re actually quite common. 95% of US households have 5 or fewer vehicle occupants, 79% of drivers don’t have towing needs, 69% of drivers travel less than 60 miles a day, and 65% of US households own more than one vehicle. 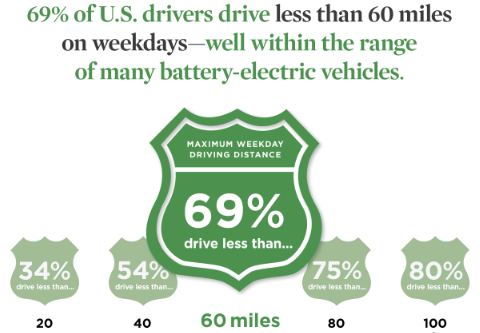 “Drivers may have preconceptions about whether electric vehicles can meet their driving needs and habits, and this survey shows that for many, they can,” said Josh Goldman, UCS policy analyst. If all these eligible Americans were able to plug into an EV instead of continuing to fill up at the pump, the economic and environmental benefits could change the way we look at transportation. UCS estimates if these 45 million households added an EV America would annually cut gasoline demand by 15 billion gallons, avoid 89 million metric tons of emissions, and save $33 billion on fuel costs. Considering just 150,000 EVs are on US roads today, that kind of a clean transportation future seems many miles down the road, but several trends hint it may be closer than it appears. The UCS survey also found 65% of Americans think EVs are essential to cut oil use and fight global warming, while 60% said they’d consider owning an EV themselves. An additional 33% of survey respondents met every single EV-ownership criteria except for access to parking with an electrical outlet, and 37% agreed that workplace charging would increase the likelihood they’d buy an EV – meaning expanded infrastructure is key to unlocking America’s EV potential. Fortunately, policymakers are starting to set goals that could help overcome barriers to clean transportation. Governors from eight states have targeted 3.3 million EVs on the road by 2025 and other states are expanding charging infrastructure. EV manufacturers are doing their part, too, by investing in advanced battery research while driving EV costs down to parity with average new gasoline-powered cars.